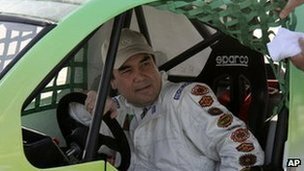 History has been made in the country of Turkmenistan – the nation's first car race has been held. And the winner is none other than the great leader of Turkmenistan, President Gurbanguli Berdymukhamedov himself. President Berdymukhamedov is used to winning electoral races (increasing his share of the vote to 97% in the elections held earlier this year) but motor racing is as new to him as it is to the rest of the Turkmen. He had not planned to take part in this motor race. However, when he arrived to watch the contest he decided that he would compete, and easily defeated the other competitors despite their intensive training for the event. President Berdymukhamedov won while driving a Volkicar, a Turkish-made vehicle.